The expert-locked door to the northwest opens to reveal a flight of stairs leading up. At the top there are several bales of straw, a large pile of firewood and a ladder leading to the lighthouse's exterior and brazier. Outside, there is a large locked chest that cannot be picked, it requires a key and another ladder leading up to the side of the brazier to allow it to be lit. Back inside, the master-locked door to the east opens at the top of stairs leading down to the cellar. there is a bear trap half way down the stairs beside a pile of food sacks. At the bottom there are plenty more blood splatters on the floor and a large pile of firewood with a woodcutter's axe beside it. Two chaurus are wandering around the cellar and by a stone pillar are two fish barrels with an iron dagger on one of them and a pole suspended between this and the next pillar holding four whole salmon. Against the outer wall to the southwest is a pile of crates and a couple of barrels, with a potion of minor healing and an iron dagger under a basket on a crate with a pickaxe on the ground beside them. On the far side of the second pillar is an adept-locked chest containing minor loot. Continuing around the cellar's outer wall, to the south is a tanning rack and to the left a set of shelves holding a bear pelt on top, some clothes and a sack of food. Farther left, past a food barrel is a second set of shelves holding more clothes, more food sacks and a potion of minor magicka. To the left of this is a pile of crates and left again are a couple of knocked over cupboards with a hole where the Falmer broke through. To the left of the hole, against the internal wall are a pile of straw bales, some crates with two lockpicks on top and two more suspended poles holding a total of eight whole salmon. At the next corner the passage turns northwest and opens into a cave with a Falmer tent opposite and cobwebs and spider egg sacs to the right. Inside the tent is a leveled Falmer and two frostbite spiders are off to the right. The passage exits this cave to the southwest, in front of the tent. The next turn is to the southwest and there is a two tiered cavern ahead containing two leveled Falmer and a leveled chaurus. 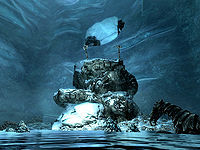 One of the Falmer is standing at the front of the ledge above, while the other is farther back out of sight and the chaurus is on the ground level behind the pillar in front. There is a Falmer tent on the left with a couple of loose chaurus eggs on the ground in front, a novice-locked Falmer chest and two loose skeever tails inside. Opposite the tent against the west wall is a pen with a closed gate, behind this is the body of Sudi with a scrawled page and a bloodstained note on the ground beside her along with a lit torch. It is implied by the note that she used her dagger to kill herself rather than letting herself be eaten alive. Under the ledge is a pillar with a chaurus hidden behind it. On the right is a caved-in section with gaps you can look through into a cavern farther ahead. The passage continues to the southeast. As it climbs you pass through another mushroom farm with several patches of white cap fungus. 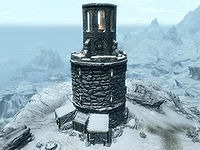 It brings you out on the ledge above where there are three Falmer tents. The first on the right contains an apprentice-locked Falmer chest. The second is empty and has several more white cap fungus patches and a Falmer war axe to the left. The third is to the left and contain four loose chaurus eggs, a Falmer sword and shield. To the west is a ledge you will need to drop down to continue. Your follower (if you have one with you) may not jump down, but instead wait for you on the higher level. To prevent this, you can nudge them over the edge by running into them or using the Unrelenting Force dragon shout.